Salad shouldn't be an obligation or an afterthought—and it doesn't always have to be kale, either. Every other Thursday, Elizabeth Stark from Brooklyn Supper will help you make salads you actually want to eat. Today: Enough with the baby spinach salads with strawberries, goat cheese, walnuts, and balsamic vinaigrette already! 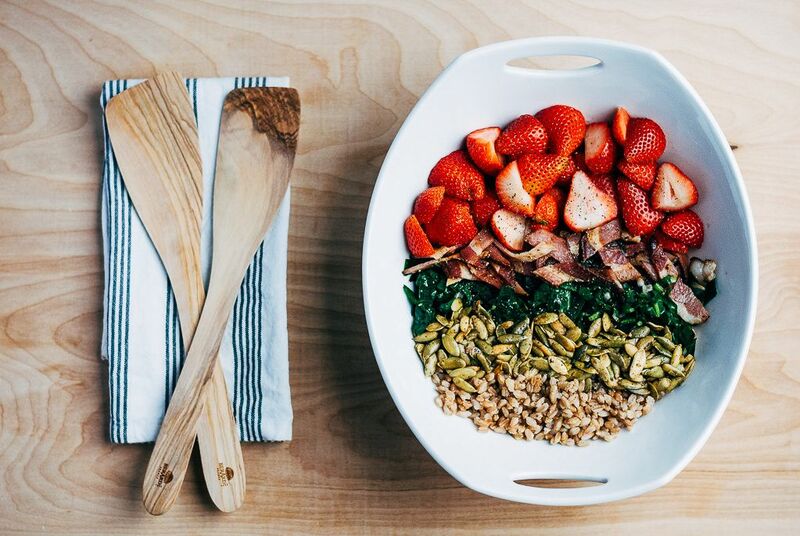 Here's a better way to incorporate strawberries into a savory salad—and it involves bacon. As spring gives way to summer, I'm grateful I can finally take strawberries for granted. The first berries of the season are precious—they're purchased or picked, then consumed on the spot. Later, there's time for carefully prepared sweets like pie and cake. But once I grow accustomed to seeing that green carton on the counter, fruit flies circling, I can finally do whatever I want with them. I like to drown a handful of strawberries in maple syrup and serve them over pancakes; I like to eat at least a quart standing over the sink, rinsing each berry one by one; but I remain cautious with salads, no matter how late in the season. I've eaten too many once-delicious strawberries sucked of their flavor by salt and vinegar. 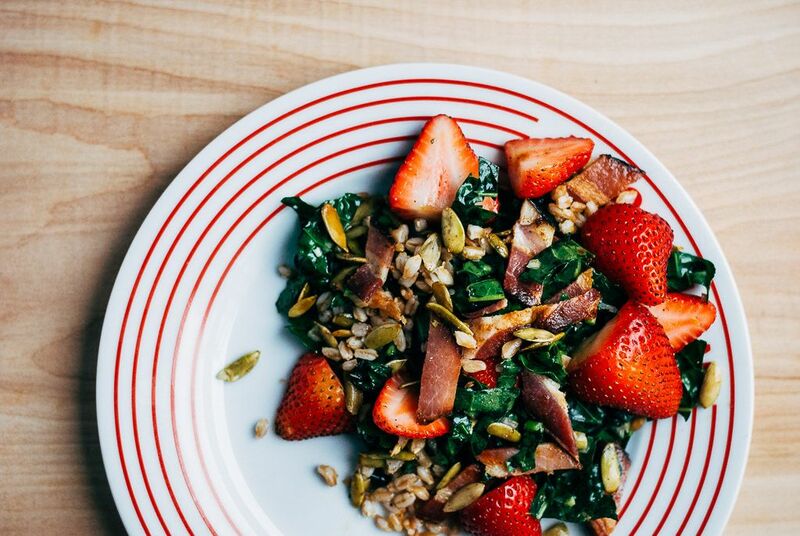 But, if treated carefully, strawberries can add the perfect pop of sweetness to a savory summer salad. By halving the berries and piling them off to one side until the last possible minute, you'll protect them from the ravages of salt. This salad piles on flavors and textures for a dinner-worthy creation that's wonderful as a side or all on its own. I like the salad best warm, when the farro has that wonderful chewiness and the sourness of the lemon hasn't yet faded into the olive oil. Like always, bacon does wonders, and salty, crunchy pepitas dusted with chili powder really bring it home. This was outstanding for dinner, and very filling. We didn't have kale so we used fresh baby spinach and arugula mix. Otherwise we made it exactly as written and we've saved it to our favorites. This sounds divine and I'm really taken by the idea of the chilli pepitas. I am saving it for when summer comes around again for us and the strawberries are sweeter (and cheaper!). One of my favourite summer time salads involves mango, avocado, spanish onion (very finely sliced), toasted pine nuts, baby spinach (but you could use any green leaf) and hot chorizo all drizzled with vino cotto. Hi Ishanthi, Wow – that salad you describe sounds divine! I love that it plays on a lot of the same flavors as this strawberry salad. I actually think mango might be great in lieu of strawberries here (while we wait for them to come back into season). Really looking forward to trying this! (Everything's better w/ bacon, isn't it?) One of my long-time favorite summer salads is strawberries & tender arugula drizzled w/ aged balsamic & topped w/ coarsely ground pink pepper. Antonia, That salad sounds wonderful! I've never had pink pepper, but am going to try and pick some up. Thanks for checking out the recipe. I think this combination of flavors will be fantastic. I appreciate the opportunity to try something new. I'll try it tonight! Thanks Caroline! I appreciate that and I hope you love it as much as I do. Please do let us know how it turns out.